A tip jar is common in cafés in the US. A tip is the small end of something long and thin. For example, you can talk about the tips of pencils, fingers, and knives. The tip of my pencil broke. 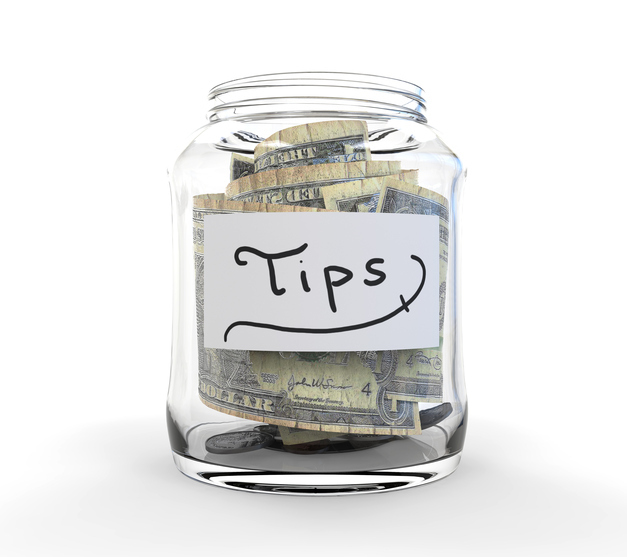 A tip is also a good idea for how to do something well. She gave me some tips for learning a language. Extra money that you give to someone because you think that they have done a good job is also a tip. I left the waiter a big tip. When you give someone extra money for their work, you tip them. At lunch I tipped the waiter $5. Tip also means to make something move off balance or away from the center. The man tipped his hat to say hello to the woman. This 1980s TV commercial is for a game called Don’t Tip the Waiter. A waiter is the person who brings you food at a restaurant. The name of the game is funny because you tip a waiter at a restaurant by giving him extra money (meaning 4). Also, in the commercial, the children put money on the waiter’s head until they will tip his body (meaning 5). There are other meanings of tip.